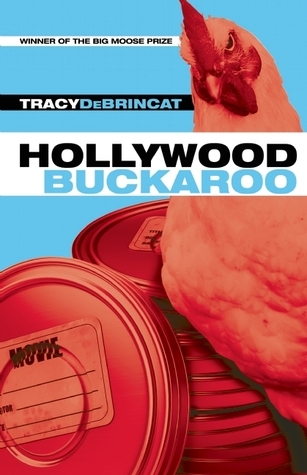 Synopsis of Hollywood Buckaroo by Tracy DeBrincat: Hollywood Buckaroo tells the improbable and unintentional coming-of-age of Sander Sanderson, whose filmmaking aspirations are in the toilet after the death of his father, a successful plumber to the Hollywood stars. Dumped by his girlfriend, and unable to grieve for his dad or face running the family business, Sander wangles a shot to direct a hamburger commercial in the old west town of Buckaroo – thereby living his dream for one whole week before resigning himself to a life he dreads. As Sander struggles to rescue the imploding project, eccentric locals jumpstart his creativity and his heart, so he can mourn at last and begin to love. “A town filled with soul-sucking zombies” is how I heard Los Angeles described at a recent gathering. This was at least an interesting departure from the usual reasons people give for hating L.A.: the pollution, the traffic, the culture-less sprawl, celebrity worship, its extravagant displays of obscene wealth and vast poverty, everyone from busboy to doctor writing a screenplay on his or her break. I always dreamed of living in L.A. I love driving (I guess that makes a difference). I love the absurd beauty I see from behind the wheel: A Jaguar with its engine on fire on the freeway. Girl in a mini-skirt on a cell phone next to an upside-down Mercedes. Coyotes slipping through Griffith Park at dusk. Horses watching traffic from their backyard stalls in Burbank. The silhouette of the Ferris wheel on Santa Monica Pier against a tangerine sunset. Valets in cummerbunds trotting to your car in perfumed, muzak-filled, 2-hours-free parking structures in Beverly Hills. And too, I love the movies. Worn-out seats of the old classic deco theatres that still show double features. The golfball-shaped Arclight. The lights going down, the music coming up. The scene that makes you weep and the gunshot that makes you jump in your seat. The moments between characters that make you suddenly discover something new and surprising about yourself or your life or truth or magic or possibility or death or history. So for me to write a book about the filmmaking world of Los Angeles seems odd yet appropriate. I am both insider and outsider, which is, in large part, the defining characteristic of living in Los Angeles, and what makes the protagonist interesting to me, burdened as he is by the opposing weights of ambition and insecurity. But it wasn’t until I drove a few hundred miles away from Los Angeles to the high desert north of Palm Springs that I found the perfect location for such a story to take place. You know where you stand in small, off-the-grid towns. You know what people think of you…sometimes just by the expression on their face. You hear things – both true and untrue – if not through the walls, then through the grapevine, and fast! You can drop by someone’s house for a visit and end up spending the night…or with a gun to your temple. Once you can handle those situations, you learn a lot about who you are and can cope with just about anything life throws your way. It’s not until our hero leaves Los Angeles and arrives in Buckaroo that he is able to shake away the artifice and disappointments of his hometown and become acquainted with himself through the eyes of others – and find that he actually has something valuable to offer. Something we can all do just by stepping outside our everyday world and taking a drive, seeing a movie or reading a book. Tracy DeBrincat’s debut novel Hollywood Buckaroo was awarded the inaugural Big Moose Prize from Black Lawrence Press and published in October 2012. She is the author of the prize-winning short story collection Moon Is Cotton & She Laugh All Night (Subito Press, 2010). A new prize-winning collection, Troglodyte, is due from Elixir Press in 2014. She has published short stories and poetry in literary reviews from Another Chicago Magazine to Zyzzyva. Although San Francisco is her hometown, she loves living in Los Angeles, where she is a freelance creative advertising consultant and authors the blog Bigfoot Lives! Definitely sounds interesting and the cover is an eye catcher. Love discovering new books via blogs. Thanks! good luck margaret! this one's quite tender despite the humour! Reminds me of the madcap hurried last minute student film projects we did at school where everybody is a director with a vision. Thanks for the giveaway. Sounds great! I would like to thank you for such a fantastic book giveaway, that i would love to have the oportunity of reading!! If i had a question for the author it would be about the writing process and how she found writing her novel; tough, hard moments? This sounds interesting. Is Buckaroo a real place?? it's a fictional place, though i'm sure there is something real out there that's similar! I would love to read this great book. I love the title. I love the cover and title of this book. I would love to receive a copy. Good luck with the book sales. Don't watch Amazon sales rankings too closely. This sounds like it would be a good read. Is there someone that you know that you created Sander Sanderson's personality from ? How long did it take you to write this book ? I am in awe of authors !